It’s one of those questions that comes up now and again when we would like to dream about ‘what if’ but I have often wondered ‘why not ?’ What is it that stops us achieving our dream of abundance? Why do some people seem to attract money / abundance / ‘a good life’ easily or even with some effort when others do not at all. The ‘energy’ around MONEY can be overwhelming because of its involvement in most if not every aspect of our lives. When this is the case, it needs to be brought into focus and organised so that each aspect can be seen and sorted out a step at a time but that is sometimes more easily said than done. The figure indicates how our personal belief systems create our understanding about MONEY but this figure could also be representative of a Community’s understanding or a Nation’s. The aspects in RED contribute to how we create MONEY in our lives and those in BLUE are how we choose to use MONEY. Every step of the process could be interrupted as I described in the post about ‘New Opportunities’. 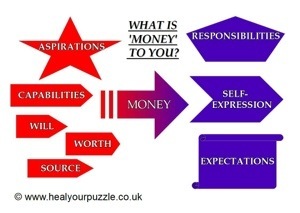 If MONEY is not an issue for you then there is an uninterrupted flow from RED to BLUE, but if any RED aspect is a challenge, there will be difficulties and a knock-on effect. infuses every aspect of our lives, from us as Individuals up through our Communities to National Government and beyond. In subtle healing terms, any aspect(s) in the figure may need healing but in order to overcome the intrusive influence of the larger group and for solutions to appear as quickly as possible, it is vital to work with the SOURCE Power – the innate ability to maintain your sense of Self within the Group – and this is true for an individual person or a nation. With this SOURCE intact and fully functional, all the other aspects will fall into place more efficiently. How this all plays out in reality is very personal and is why Kinesiology is an invaluable holistic tool to unravel its complexity and help you live your life to its fullest potential.